How is it that you spend twice as long milling short logs for half the lumber? 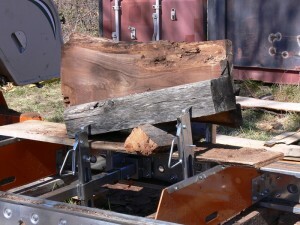 The fact is, sawmills are typically designed to take logs 8’4” and longer. Anything shorter either gets cut for firewood or left out in the woods to rot. 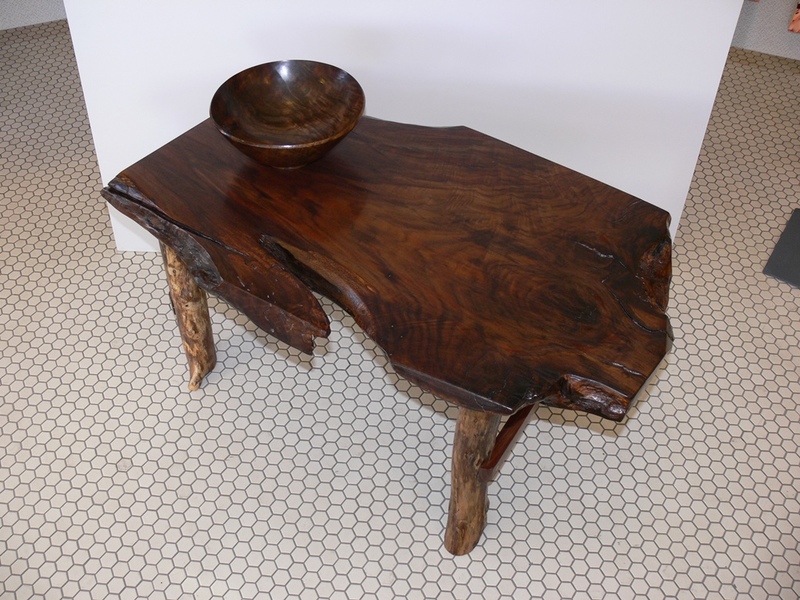 These are often logs with “character”—crotches, burls, bends, and unusual grain. Once you learn how to mill these logs, you may find yourself flooded with requests to do custom jobs that other mills had turned down—and access to terrific logs that most mills just won’t accept. 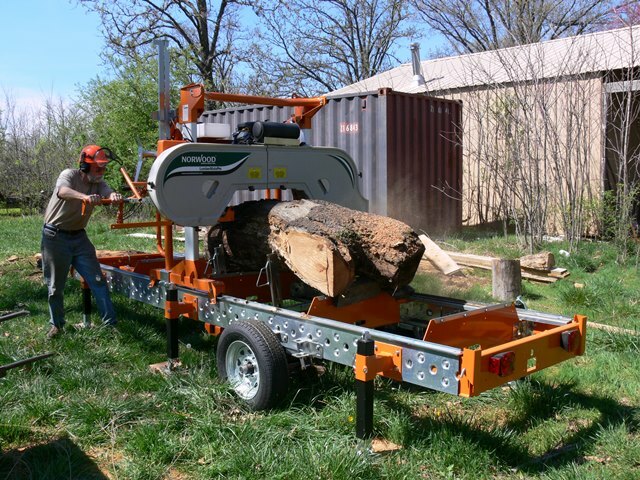 If a customer wants short logs milled, he or she needs to understand that the cost will be significantly higher than milling full-length lumber. Consider doing this work by the hour, since there are a number of variables. Getting a 24” by 3’ long log on the mill will be your first challenge. It is too short for normal hydraulic loading arms, and if you try to winch it up a ramp, it will go every way but straight. A front end loader with log tongs works well, especially if there is a second person to help guide the log and hold it straight. The next problem is where to put the log on the mill, since the cross bunks on most mills are too far apart to support a 3’ log. Bridging across cross bunks with a board is the best solution for most sawmills however some, like the Norwood, allow for additional cross bunks to be installed wherever they are needed. The log stops, likewise, are too far apart on most mills. The solution is a 1 x 4 or 1×6 to bridge across the log stops. 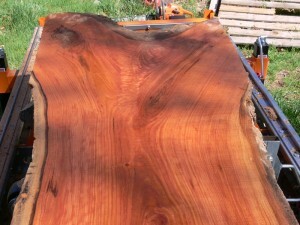 This is a “sacrificial” board, since you will cut it on the last couple of cuts of the log. Clamping is easy if you can center the log on a clamp. It will push the log against the board bridging across the clamps. 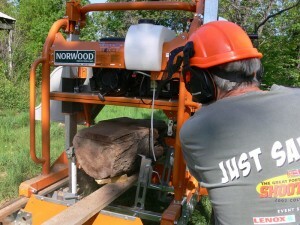 The easiest cutting pattern is to simply slab the log, if possible. As long as the clamp and supports hold it steady, keep milling. That way, it will be as light as possible when you turn it. 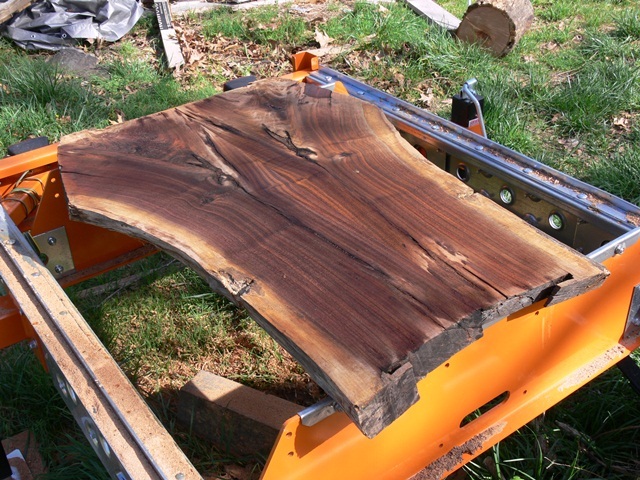 If possible, I generally rotate the log 180 degrees when it has been cut a little more than half –way down. The log now has a flat, stable side, and will not be prone to rolling. When it comes down to the last few cuts, you will be milling through the sacrificial board along with the log itself. Another thing to remember is that, since the log is riding up on the bridge between cross bunks, it is higher, and you need to adjust your readings on the height scale accordingly. Once the log has been slabbed out, the individual slabs can be put back on the mill for edging, though I generally tend to dry them as slabs and let the customer decide how (or if) to trim it. Many of the short logs I get at my mill are crotches, often walnut. These can be especially challenging, since they need to be cut crosswise to get the fancy “feathered” grain pattern. The first task is to trim them with a chain saw, if necessary, so that they will fit between the blade guides of the sawmill. On some mills, it is possible to remove the blade guide to get a few extra inches of width. The trick to getting the best grain is to line up the three centers of the main part and the two branches so that they are all the same distance from the cross bunks or support bridge. That way, the blade cuts parallel to the pith (center of the growth rings) of the log. Unless the customer requests me to do otherwise, I always slab crotch wood. For gun stock blanks, you might want to cut as thick as 4” slabs out of the center part. The key here is to think it through and have everything carefully clamped securely before you begin the cut. You will often spend twice as much time clamping down the board as you do actually cutting!